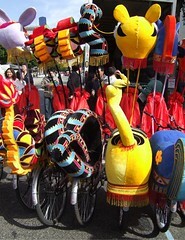 Animal bikes from a Chinese New year celebration. With the traditional New Year’s day ride coming up, wondered if anyone had something special planned? In Amsterdam, the first day of the year, looks like this: bike piles. It’s just Pam and me in Kona, riding bikes, and we’ll celebrate New Years Japanese style with a year forgetting party. Meaning, let’s focus on the new year. Uploaded by elaine layabout | more from the Bike Hugger Photostream.